Ease One Life the Aching is inspired by the poem from Emily Dickinson and is a linear holographic multichrome polish that flashes from purple/pink/gold. 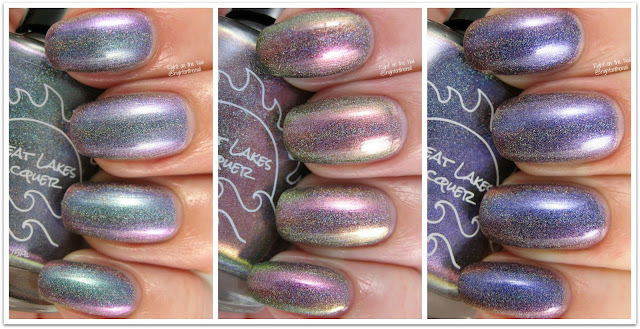 The shift in this one is slightly muted compared to the other holos, but it's definitely there. And there is no mistaking these for scattered holos...this is all linear, baby! All polishes applied flawlessly, so you will be bored when I talk about the formula for each polish. Pictures above show just 2 coats. Like Air, I'll Rise is inspired by the poem by Maya Angelou and is a linear holographic multichrome polish which flashes from green/blue/pink/purple/slight gold. Whew, that's a LOT of colors! The shift is dramatic with this one, and I'm obsessed with it. Dare I say this is my #1 pick from the collection? Swatches show 2 smooth coats. The Centre Cannot Hold is inspired by a poem by William Butler Yates and is a linear holographic polish with shifts from pink/purple/gold/green. Wait, did I say that Like Air, I'll Rise is my favorite? Gah, don't make me choose! I've worn this at least 3 times since I got the collection, and I always get compliments on it. Always. Again, I only needed 2 coats for full opacity, and the formula was great. So listen, friend, you should go ahead and get these. I really loved my Tonic polishes, but I like the formula much better with these. These are on sale right now on the Great Lakes Lacquer site, and each polish retails for $11-$12 each, or go ahead and get the whole collection for $87...you deserve it. Make sure to check out what Great Lakes Lacquer is up to on their Facebook and Instagram pages as well.